Many seniors assume exercise won’t help them once they reach the age of 65, but this couldn’t be further from the truth. 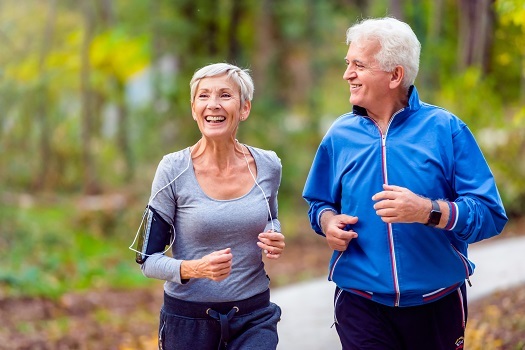 Maintaining an active lifestyle at any age can help seniors stay young, maintain mobility, lose weight, alleviate symptoms of chronic diseases, and boost their overall mental and physical wellbeing. If your aging loved one isn’t active or is having difficulty staying active, use these tips to encourage him or her to keep moving. Many seniors say they simply find exercise too boring, which prevents them from moving as much as they should. If this sounds familiar, help your loved one find a way to remain entertained. If he or she likes to walk, listening to music, podcasts, or an audiobook can help. Your loved one can also ride a stationary bike or treadmill while watching a movie or TV show. If any of these ideas appeal to your loved one, help him or her set up the right equipment and services to get started. Professional caregivers can help seniors exercise regularly at home. Many older adults are choosing to age in place, and some need a helping hand to continue living at home safely and comfortably. Luckily, there is professional elder care Sacramento seniors can trust and rely on. Exercising with a friend or family member turns the activity into a social outing. Encourage your loved one to find a companion who can meet for daily walks, tennis matches, golf games, or water aerobics classes. They can have lunch or coffee together afterward to make it even more fun and exciting. Turning a workout into a meetup can also keep your loved one accountable if he or she is tempted to skip out for the day. If your loved one doesn’t like the idea of a human companion, a dog is a great substitute if he or she is able to take care of it. Sometimes all the encouragement seniors need to keep moving is to try a new activity. Walking down the same street or on the same treadmill in the same room everyday could be enough to make anyone dislike physical activity. Check out the local gym, senior center, community center, or religious organization to see if they offer any type of activities specifically for seniors. You may find an assortment of classes, ranging from ballroom dancing to water jogging. You can also look into sports your loved one has always wanted to try, like golf, tennis, bowling, or softball. There may be senior leagues in your area. Many seniors avoid exercise because they think they have to go to a gym to do it, and they aren’t comfortable exercising in such an environment, or they don’t drive and can’t get there as frequently as they’d like. Finding a variety of safe activities for your loved one to do at home can change all of this. You can purchase home gym equipment like hand weights, a bike, an elliptical machine, or a treadmill, and you can also invest in some workout DVDs or downloads aimed specifically at seniors. Everything from yoga to aerobics is available. There are even home workouts available for seniors who have low mobility. Even if seniors decide to work out at home, they need help staying active every day. Sacramento at-home care experts are available to provide high-quality care to seniors on an as-needed basis. From assistance with mobility and exercise to providing transportation to the doctor’s office and social events, there are a variety of ways professional caregivers can help your aging loved one continue to live independently. One complaint people of all ages have about exercise is that they don’t have time to do it. If your loved one makes this claim, it’s time to figure out a way to schedule it into his or her day. Maybe it’s the first thing to do in the morning, or maybe he or she does it at noon. Whatever your loved one chooses, turning it into a habit eventually makes it easier to stick to. Staying active is important for seniors, but some also require regular socialization to stave off depression and loneliness. For families living in Sacramento, respite care can be a wonderful solution when their aging loved ones need companionship and socialization a few hours a week or just need minor assistance with daily household tasks. At Home Care Assistance, we thrive on helping seniors maintain their independence while living in the comfort of home. To schedule a free in-home consultation with one of our Care Managers, call us today at 916.706.0169.